I did one better than that. I told 3 club mailing lists that I belong to (approx. 2000 members total) about your very interesting news letter. Thanks for your help !! I'm really fired up about getting the sport of motorcycling the recognition it deserves. Feel free to post the URL's of Power News newsletters to your favorite newsgroups or forums. How can I access all the Power News past issues ?? "Dynamic Horsepower Starring: Britney Spears"
is to make the ports smaller. waay too big as they come from the factory !! ...Even for Roadracing use !! 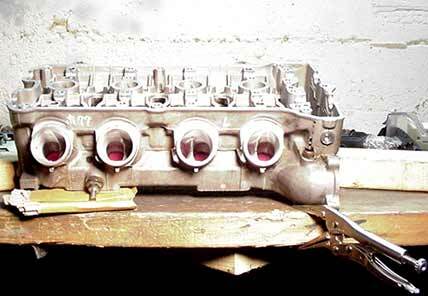 as many tuners will make their intake ports even bigger !! This bike was really, really slow !! 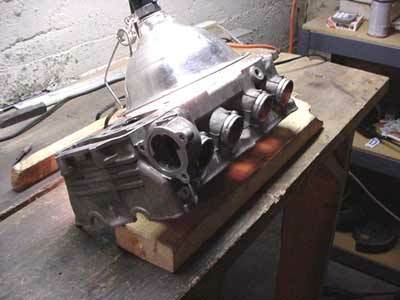 The head measures well on a Flow Bench, but the engine actually produced Less Power with this ported head than it did with the original stock head !!! 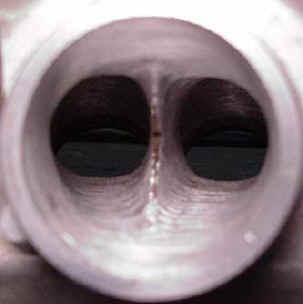 What Do High Velocity Intake Ports Look Like ?? 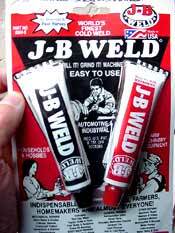 This product does the best job of expanding & contracting with the engine heat without cracking, or coming loose. 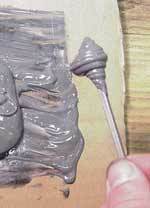 Other products that work well are Loctite "Metal Set" (available in Europe) and Bondo automotive body filler. 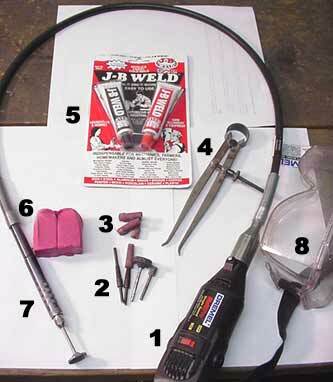 I recommend the JB Weld because it sets up slowly, which can be a real plus when you're first learning this porting technique. Ready To Do It Yourself ?? That's right !! Any traces of oil will ruin the sanding rolls, and make the head an oily mess to work on !! 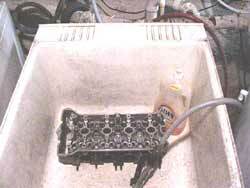 So the first step is to wash out all the oil with dishwashing detergent and hot water. 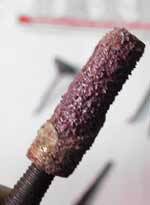 Use compressed air or a blow drier to prevent rust. It's critical that the head is secure and stable. 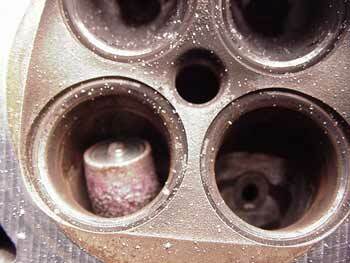 It's very easy to ruin a valve seat if the head suddenly shifts while the porting tool is turning at 24,000 RPM ! Use a 2X4 board to "wheelie" the head into the proper position. The clamp-on type light illuminates the ports from the combustion chamber side. The end of this sanding mandrel is off center. The result will be inefficient sanding action and chatter marks on the port surface. 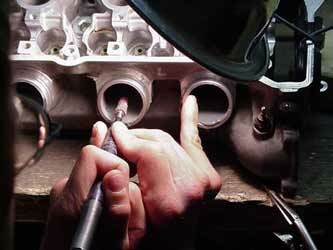 Uneven wear on the sanding roll can cause it to unravel at high speed and possibly damage the cylinder head. 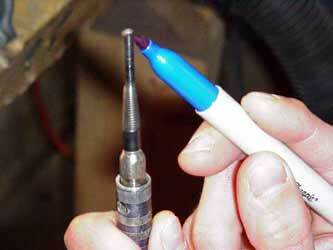 Here, I'm using a marker to find out which way the mandrel is bent. By lightly touching it with the marker while it's spinning, the ink will only show on the "high" side. to bend the mandrel too much. throw it out and start over with a new one. 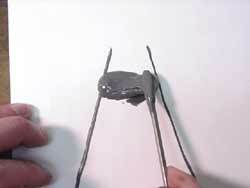 They get weak from being bent, and can suddenly bend out 90 degrees while spinning 24,000 RPM !! Here's the best way to hold the tool. I let the dremel motor hang over my right shoulder, and hold onto the drive cable with both hands. The bottom of my hands are pushing slightly against the bench to help steady the tool. Also, notice that I've anchored my right hand with my little finger. This gives the best combination of power and control. With some practice, you can really let the sanding roll "torque" into the metal without losing control. 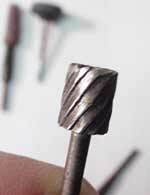 Use a griding stone to grind the steel valve guide. 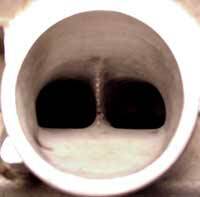 Many newer models' valve guides are already flush, so you get to skip this step. Once most of the steel guide is ground down, use sanding rolls to make the aluminum boss & valve guide flush with the port roof. Then, finish the entire port surface using 60 grit sanding rolls. 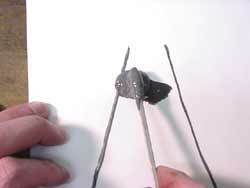 Use it to remove the fuel residue, and create a rough port surface. Use it to score the port floor to secure the epoxy. 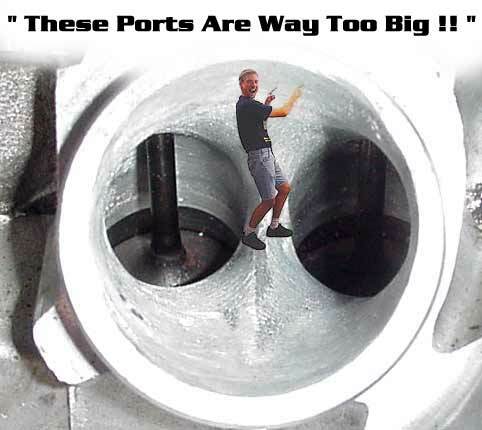 Why Not Polish The Ports ?? Doesn't Air Flow Better on a Smooth Surface ??? Remember that the ultimate goal isn't "flow" ... it's POWER !! 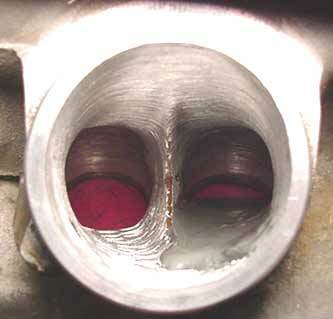 The intake port is going to flow both fuel and air. The problem with fuel is that, since it weighs more, it's difficult to keep it evenly mixed with the air as it follows the contours of the port. The next time you drive a car in the rain, notice that when the car is going 60 MPH, the rain drops go up the hood of the car at walking speed. That's because the smooth surface of the car creates what's known as a boundary layer, and the portion of that layer of air that's nearest to the surface is almost still. 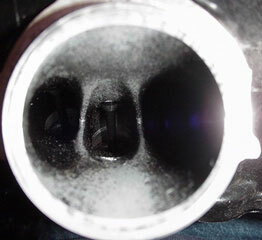 The same thing happens inside an intake port. Except instead of raindrops, it's fuel droplets that will run down the port wall slower than the air. That causes a serious change in the fuel air mixture by the time it reaches the cylinder, ruining much of the engine's potential power. 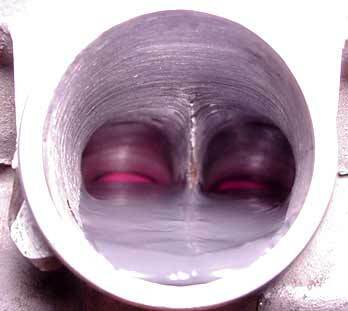 Polishing the port walls will ensure that this happens. The phrase "Port & Polish" always makes me laugh ... I think the idea came from 70's Hot Rod magazines or something. Anyways, the last thing you want to do is polish your ports !!! 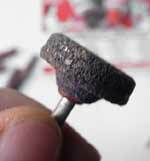 Instead, by making a series of rough 60 grit lines that purposely go against the flow, the "boundary layer area" will be turbulent, and the fuel will stay suspended in the air. Remember: Rough is Good !! it's time to prep the head for epoxy - ing. First: Wash & Dry The Head Again !! 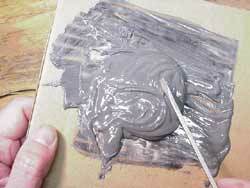 Here's what the clay is used for !! 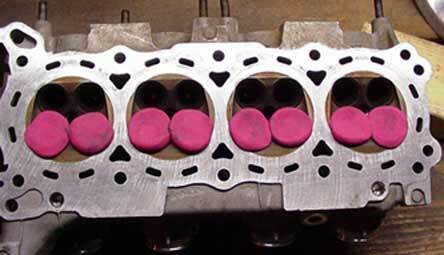 It keeps the liquid epoxy from flowing out and onto the valve seats. Next, set the head up so that the floors of all 4 ports are level. 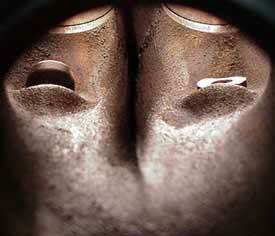 On most heads with downdraft ports, the head will have to be "wheelied" as shown here. The hardest part about the next process is not getting yourself covered with epoxy !! My advice is to wear old clothes, and keep a fresh roll of paper towels on hand ! Cold epoxy is super hard to squeeze out of the small cap end of the tube !! 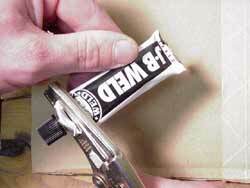 Then, I use a vise-grip pliers to squeeze out all the goo onto a sheet of cardboard. 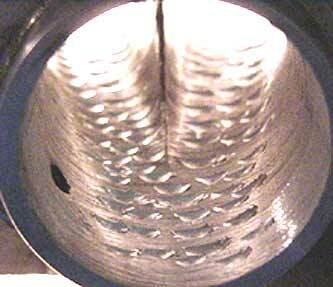 You'll use about 1 package of 2 tubes each (steel & hardener) per port. Mix up one at a time. Clean the screwdriver completely, then twirl up a blob as in the photo on the left. Keep rotating that screwdriver !!! Remember: The minute you stop, the blob will drop !! The idea is to add the epoxy to the deepest point first and then back up. I add the epoxy in "rows". The first row will flow down onto the clay barrier. It was impossible to get a clear photo as I added epoxy into the port, so I'm demonstrating it here on paper. 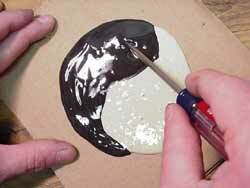 To avoid bubbles, start on the left side, and rotate the screwdriver as you "lay down" the epoxy. 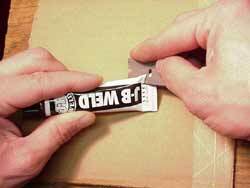 Be sure to make the epoxy a little thicker on the sides. 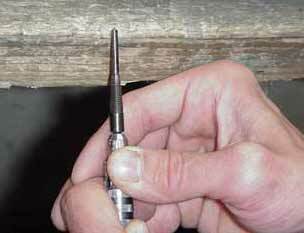 Then when the right side is reached, twist the screwdriver as you back it away. 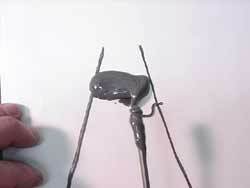 That keeps the last strand of epoxy from getting out of control. you can really see the size difference !! the side walls, to avoid air bubbles. 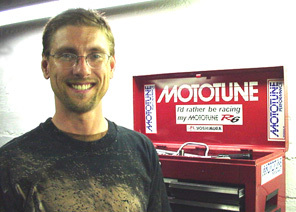 2 Ways You Can Help Mototune USA !! There's 16 More Back Issues ! !